My apologies for the delay in updates. It has been a busy 2 months - both in Ecuador and in the States - but here are the brief highlights in anticipation of the big July mailing that is currently in the works... if you are not yet on the mailing list, email me at [email protected] to join! I left Ecuador at the end of April to take care of some personal business, but I was very pleased with the goals that we achieved during the 4 months (Jan - April) that I spent in Pascuales. I am working on a complete update mailing which will be sent out in July with photographs and details of the many challenges we have faced recently, as well as some of the solution we have engineered. We would love to hear your feedback and suggestions so please keep an eye out for the mailing! 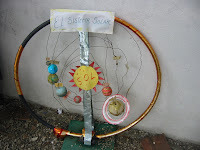 "Que todo sea por los ninos de Pascuales"
Festival of Science and Art! The children waved their masks and roared like Wild Things!... jumping up and down and gnashing their teeth. Today was the Children of Pascuales' first play production. They worked all afternoon on their costumes, meticulously decorating paper plate masks with feathers, yarn, beads, and other art supplies donated by the Rockville Arts Center in Maryland. And after hours of flowing creativity and excitement, they performed "Where the Wild Things Are!" one of the most celebrated children's books of all time. This Sunday Doctor Xavier Cruz visited Pascuales to give a talk on Sexual Education, one of the topics in most dire need in the community. 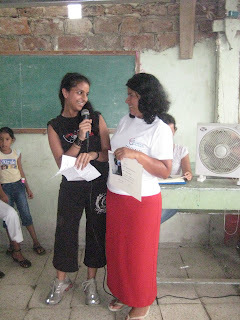 The women of Frente Femenino organized for the visit, delivering invitations to all their neighbors, and the turnout was huge. Over 65 adults and adolescents filled the tiny bamboo schoolhouse where the event was held. Dr. Cruz spoke for an hour and a half and was bombarded with questions. He stayed after the talk to take the blood pressure of the elderly members of the community and has offered his services to return and continue teaching in the coming weeks. After 7 months of paperwork, we are now only THREE signatures away from completing the land purchase...! Besides the paper work, Nicki found last week the architect and construction supervisor for the project. I can not believe that the next time that I am going to be in Pascuales, there is going to be a fence and hopefully the walls of the community center. After two years of hard work we are getting so close to the begining of this great adventure. I say it is just the beginning because you can just imagine what it is going to be like and the new challenges we are going to face when we have the community center up and running. It has been exciting to look at the pictures of the last two months. 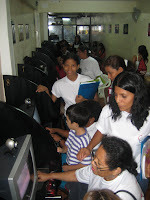 Watching all the familiar faces wearing the Children of Guayaquil t-shirt, sitting in the computer classes has been wonderful. It is all thanks to the technology that has aloud us to get a peek into what is going on in Pascuales. I get extremely happy every time I get and email from Marcela, Verónica, Bertha or any of the ladys from Frente Femenino. I am proud of them but it is extremely difficult not to BE there, physically, to share in their every day experiences. I feel like catching a plane after every time I talk to Nicki. While Nicki is visiting the municipality every single day to push the paper work, getting together with engineers and architects, and participating in the Frente Femenino meetings; I am trying to concentrate in my school work in Georgetown and arranging some presentations to spread awareness about the project. It is so hard to be part of this team, yet be away from Ecuador. 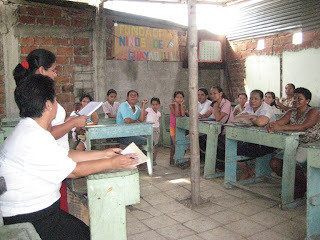 At 3:30 the women of Frente Femenino started arriving for the weekly meeting. One by one they took their seats until 4PM when the little bamboo schoolhouse was full. Right on time. This meeting was already a far cry from just 1 month ago when a meeting time of 4PM signified most arrivals would be between 4:30 and 5:30. The women have learned to respect the clock and have seen the powerful results of how quickly things get done when their meetings are able to start on time. President Marcela and Secretary Antonia stood at their places at the front of the room to command attention. "Puntos del dia," began Antonia, reading the minutes from the last meeting and the agenda of the day. In just 35 minutes, the women of Frente Femenino had achieved all of the goals of the afternoon. They were updated by member Bertha Icaza on a new program of government loans to start small businesses, they voted to hold a raffle fundraiser (clock lamp donated by Marcela who received it as a gift), and they voted to organize a security talk aimed at youth in the community in preparation for security awareness of the community center building we are working towards. And the business manager, Beatriz, collected $0.10 from every member in return for the first fundrasier of the year, a suprise raffle. Prize: a new pair of scissors and a pack of gum. That first $3.00 they raised at the Frente Femenino meeting on Friday signified more than 30 women with one dime and the spirit to collaborate. That $3.00 represents a dream that each of these women is fighting to achieve for the advancement of Pascuales and brighter futures for their children. This update will be short as I am about to run out the door to meet with Frente Femenino in Pascuales but I wanted to let you know that the team of architects and engineers has been united down here in Guayaquil and we are moving forward quite a bit faster than I anticipated. Yesterday they visited the land to take soil samples and analyze the septic system. We are going to clear the land to prepare for construction while we finish getting the rest of the permits in the next few weeks. It is an unbelievable feeling to be working with people who have even more energy than I do. When days get difficult or frustrating, they give me the confidence and motivation to pick back up and keep going. This is a team effort 100%. Les dejo, pero como dice our new head engineer... "AL ATAQUE!" The month of January has been a wild ride, full of excitement, disappointment, adventures, frustrations, and small victories that continue to motivate and energize me. Nisha completed her computer class and left for the United States Sunday morning. 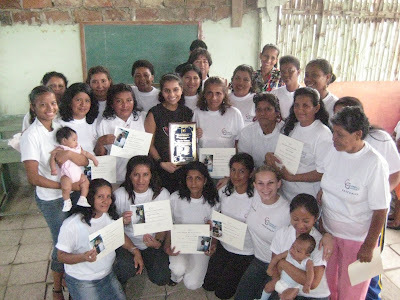 On Saturday afternoon she held a graduation ceremony for the 23 women that successfully finished the course. It was an amazing experience to watch them progress in just 3 weeks from fearing to touch the mouse (they didn't understand how touching the mouse moved the cursor on the screen), to sending emails with attachments and doing internet research. And it was even more incredible to see the pride in their faces when they received - for the first time - an official certificate with THEIR name on it. These women are fired up and already asking for the next class to begin - which they hope to be English. I think as proud as they were, we were even more proud of the effort they put in. It was not easy for them, as most students came to every class and every practice session just to work on their hand eye coordination or study the letters on the keyboard. The group even collaborated, donating $.50 or $1 each to make a personally engraved plaque for Nisha in thanks for her time and efforts on their behalf. In addition, I am very pleased to report that after a few hiccups at the beginning of January, the paperwork in the municipality is moving along quite nicely (thanks to the support of the Vice Governor). Although it is never easy, I remain cautiously optimistic as we continue forward. This Monday and Tuesday was the celebration of Carnaval which is like a water fight - but where the ENTIRE country participates. I left the house every day with my water gun loaded and layers of clothing to peel off as they got soaked through. I am writing this update very content, slightly sunburned, and drenched from Carnaval, so I'm off to clean up! This week I have been in the municipality every single day working on the land purchase paperwork and making contacts with people who may be interested in collaborating with us to further the success of our projects. Nisha has been venturing to Pascuales on her own each day to give the computer classes and I have not seen the women or the children for nearly a week. It is difficult because, after all, they are the reason that I am here. Alas, I have important things that must be taken care of in the Municipality before we can continue advancing in Pascuales. Today I was working and Nisha took off again to Pascuales. I was feeling quite a bit frustrated and things weren't going as well as I had hoped. Sometimes it is easy to loose sight of the motivations behind the frustrations. Sometimes it is easy to forget why I am here and what I am fighting for when my head is lost in paperwork. Well today as I was getting into a little slump when an EMAIL arrived. This email came from a woman who until 2 weeks ago, had never so much as touched a computer. Since Nisha started her classes, this woman has come to every class and every practice session totaling 6 days a week and over 14 hours. She even went so far as to borrow a machine from a neighbor to practice typing in order to learn the placement of the letters on the keyboard. She has worked hard on her skills and this is the first time Nisha, Andrea, and I have seen the results. Uste sabe cuanto la queremos y le apresiamos por todo el sacrificio que hace por toda la comunidad. Gracias de todo corazón que dios la proteja. Days like today remind me of the importance of our work, the real personal stories hidden behind the piles of paperwork, the power of the hope that Children of Guayaquil brings to an entire community, and the strength of the friendships between people of two totally different worlds bound by the commonality of being, simply, human. Nisha and I got to Pascuales about an hour early on Saturday. Many of the women arrive before the computer class starts at 3:30 and we want to make sure we are there to greet every one of them as they come through the door. We were next to the Cyber cafe buying some water from an outside stand when we heard our names being called. Beatriz, the most senior of our students and one of the most enthusiastic learners, shuffled over to us and laid both hands on our shoulders. "While it is just the three of us," she started, "I want to personally thank you for this class. Both of my sons have their own computers and I have never even gone so far as to touch a mouse, but your class has inspired me to learn and I find computers so interesting now that you have brought all this to my attention. Some people tell me that I am too old to learn but I am proving them wrong. So thank you." Life here is not easy, the mosquitoes are fierce and last night I woke up at 3am with a cockroach on my head, but Nisha is feeling successful in her work, enjoying the adventure, and most importantly, she is really impacting the community. Computer Classes in High Demand! The women crowded into the tiny bamboo school house. Chatter was loud and energy was bursting. Some brought babies that played in the corner, others brought older children that sat with anticipation, hoping that there would be room in the computer class for them too. Today was registration day. One by one, women took turns to sign their form, have their picture taken, and be given the class schedule. 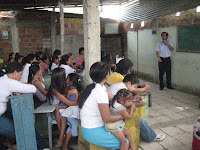 There were far too many people in the room than we could accommodate in the computer class, and although it hurt to have to turn down the children, whose desire to learn was so strong it brought tears to me eyes to think about the opportunities they had never been afforded, the women of Frente Femenino must be given priority. As one lady came up to me and told me how bright her daughter was and how much she wanted to take the class with us, I explained the idea of passing down knowledge. I explained to her that if SHE learned, then she would have the power to teach - not only her daughter - but all of her 6 children. This concept was foreign to the young mother who never felt that she had much to offer to her children, but a smile formed on her face as she realized what that meant for the future. Within 45 minutes class registration was full and the women left the schoolhouse excited about the possibilities and looking forward to the first class on January 15th. Andrea and I hopped with anticipation into a little 3 wheeled tricimoto in the center of Pascuaels. The motorbike with the muddy cart attached to the back pulled up to a halt, blasting reggaeton until the soft plastic canopy shook to the music. "ASSAD BUCARAM POR FAVOR!" I yelled through the music. And we barely had hopped in the back cart and taken our seats as he took off down the street hitting potholes that made us bounce up and down like Ecuadorian jumping beans. It was only a matter of minutes before we were rounding the corner to the muddy path where Bertha's cement and bamboo shack stood. Bertha's 9 year old daughter Clarita was already waiting for us waving and smiling as the tricimoto let us off at the corner. Our first day back in Pascuales after 6 months was like coming home. People came out of their houses to welcome us with big hugs and kisses - we were so happy to see everyone. After 5 trips, they know that we are in it for the long haul - fighting right by their side. Andrea is now back in the United States and I am here in Pascuales with Nisha, the MIT student who will teach computer classes this month. This first week has been full of town meetings to register the women for the classes and get them all the materials that they need to be successful students. Saturday was my 23rd birthday and after a long day's work, Bertha and the women of Pascuales threw me a surprise party! 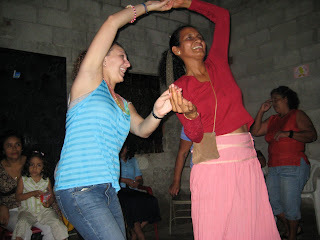 We danced salsa and meringue - and ate crabs and mangos - until the January rains came late at night and flooded us out. It certainly was a birthday to remember. I'll keep you posted with more updates next Monday! I am thrilled to report that I will be graduating from MIT on December 18th (!!!) and am excited to be making my 5th trip to Pascuales on January 1st. I plan to stay through most of the spring to help move along the government paperwork, and - all going well - oversee construction of our community center. Andrea will be joining me for New Years in Pascuales during her winter holidays from Georgetown University where she is studying a year of International Relations with some of the top professors in the field. She will be returning to Ecuador permanently in June and looks forward to spending lots more time in Pascuales, applying the knowledge she has been learning over the past year. We are still waiting on the municipality to finish the final land purchase paperwork, but we are learning patience and flexibility through the process. In the meantime, the architectural work is ready and we are doing logistical planning for the start of construction, as well as continuing to build spirit and confidence in the townspeople that have become some of our closest friends. I am also happy to report that this January I will be taking my 9th MIT student, Nisha Vahora, to Pasucales to teach communication and technology initiatives to the group of women who formed the committee "Frente Femenino!" in support of our projects. It will be a busy start to the new year but I am proud of the many small feats that make me confident that we will reach our goals. CHECK THE WEBSITE EVERY MONDAY FOR UPDATES! During my extended stay in Ecuador this spring, I will be adding posts to the "Updates from Nicki" website page every Monday, starting January 7th, 2008. Please check to the site to learn about recent accomplishments - and challenges - and to see new photographs of the children and community members that are motivated by your confidence in them. I look forward to continuing the adventure and will keep you all up to date on progress over the next few months in Ecuador! Thank you for your continued encouragement - your kind words and emails give us the energy we need to continue the fight for Pascuales! 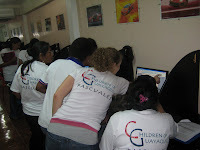 Children of Guayaquil, Inc. is very proud to have invited five MIT students to visit Pascuales this May. Within just a few days, Francesca DeMeo (´06), Sadie Wachter (´07), Lara Hershcovitch (´07), Steven Nunez (´09), and Chris Bukowski (´09) had become part of the community - a community that has risen to every occation to bring opportunities for their children. The students planned a Childrens Festival for the town, taught English, French, Chinese, gave a lesson about the solar system, danced the HokeyPokey, sang Head Shoulders Knees and Toes, made bracelets and necklaces, and played lots of soccer. It was an experience that neither the students nor the town will ever forget. The first thing I noticed in Pascuales was everyone's smiling faces. It is a simpler life there. Despite their enormous hardship they face each day to build their home, raise their children and put food out on the table, I am almost jealous that they find happiness in face of any obstacle. It is a truly special community that appreciates the few things they have. I found the town of Pascuales very unique. Walking into the community there was music coming out from every other home. It filled the air as we walked down the dirt paths to visit Nicki's friends. Our first stop was to see Bertha, vivacious woman and caring mother. She took as in and showed us around, eager to offer us refreshments. She has worked hard to build her house from nothing. The newer part is made out of stone, which stands in front of the older part, which is made out of bamboo. What I found most interesting was the mix between modern technology and simplistic living. The houses were made out of bamboo sticks, metal sheets, or what ever a family could find. It almost reminded me of nesting. And yet, some houses had TV's, stoves, and CD players. The best way I could describe it is like taking a step back in time and throwing a few electronics into the mix. Another interesting observation I had was that all the homes were open to the air. There were no glass windows and few fences. Perhaps this is what makes such a great community of people. On the second day in Pascuales, we held a festival for the children, much thanks to Bertha who helped us get the word out by announcing the festivities to the communities through a rather large megaphone. It seems that all the children there are truly beautiful. Their big brown eyes seem to look straight through you. I speak almost no Spanish other than "Hello", "Nice to meet you", and "Where is the bathroom, please" and yet within a few hours, I was playing with half the little girls in the community. We danced salsa, made necklaces for each other and the girls tried to see how many could climb on me before I fell over. I think we got up to about 5 girls. They are the friendliest children I have ever met and it broke my heart to have to say goodbye. Another amazing fact of these children is there eagerness to learn. Francesca headed an English lesson on our third day in Pascuales. In a small dilapidated school room, the children sat practically on top of one another. But they listened intently and participated enthusiastically. I think they were really disappointed when Francesca told them she wouldn't be their regular school teacher. I see tremendous potential in these children. After one lesson, the girls I had become so close to were communicating with me. As hard as it was trying to speak Spanish to them, they were learning English much faster. As my optimism for these children soared, I must remember reality that their gifts can never flourish without a proper education to guide them. 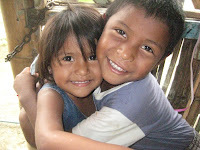 These children not only need English lessons, but also other forms of education. I was handing out Starburst to the children and a very young mother puts out her hand. I give one to the mother who proceeds to put the entire candy, wrapper and all into her tiny infant's mouth. To avoid a near chocking incident, I pulled the candy out of the infant's mouth as politely and swiftly as I could. Health education is in dire need here. I hope next summer I might be able to return and commit more of myself to this extraordinary community. As one of my best friends has taught me, one person can make a difference. 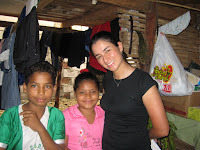 I have always been aware that in countries throughout the world there are people that don't have the same privledges, opportunities and resources that I enjoy everyday, but only after visiting Pasquales did my awareness turn into a genuine interest and desire to help these people in their struggle for a better life. The people living in Pasquales are some of the nicest and most generous people I've met in my entire life. The only thing that can match their hospitality is their own desire to make life better for their families and the community. Traveling through Ecuador from the coast to the mountains was anexperience I will never forget. The country has an incredible rangeof natural beauty in such a small area. Unfortunately, the citiesalso have a large range of wealth as seen in the new and shinytourist spots in Guayaquil to the dirt roads and bamboo shacks ofPascuales. Despite living in such conditions, the people of Pascuales were thenicest people ever, always offering a chair and something to eat anddrink. The children we worked with were always smiling, always askingquestions. When it was time to leave, their cries of "no te vayas,"as well as the clinging to our arms and legs, made separating verydifficult. The positive attitude these people were able to keep, evenwith all of their hardships, amazed me. Their glowing attitudecombined with the interest they took in what we had to share withthem made for a wonderful experience. Traveling by bus in Guyaquil is an incredibly exciting experience. It costs 25 cents to ride anywhere you want and there are so many buses that go absolutely everywhere. Getting in the bus is a huge ordeal. You have to check for a small number posted on the front window of the bus that tells you its route (and I saw numbers ranging from 1 to 50 or so, I have no idea how many routes there are or how they keep track!). Once you see your bus you have to hail it like it's a taxi because there are very few official stops and it's mostly a hop on hop off thing. And by hop on I literally mean hop on because the bus never comes to a complete stop! Once you're on the bus the fun begins. People jump on selling all sorts of things, candy, food and more. I think my most cultural food experiences involved trying things that walked by me on the bus. It was 25 cents for everything. I tried cheese empanadas, chicken empanadas, fried plantain, papas rellenas (potatoes) and more. One of my favorite parts of the trip was giving English lessons to the children in Pascuales during the festival. After games and crafts the day before I was wondering whether the children would even want to show up for "school" on a Sunday. To my astonishment when we arrived there were already dozens of kids there. Some showed up with pencils and paper to take notes. By the time we started the lessons the classroom was full and this kids were eagerly listening to everything we said and having lots of fun repeating all the words and phrases we taught them. They were engaged and interested. By the time we got to the astronomy lesson there we could no longer fit all the kids in the classroom so we had to take them outside to start some activities. The lessons were over at that point but many still approached me asking what would be taught next. We stopped by another school in Pascuales and I was completely moved by this beaten up model of the solar system lying against the wall. The whole area was open and empty with dirt ground except for two bulletin boards with info and the solar system. I pointed it out to Clarita and asked her what planet we live on. She responded Ecuador. I asked Ernesto how many planets there were and he said 10. Intrigued I asked him to name them. He got 7 forgetting Jupiter. I also mentioned Pluto at the end and he added with enthusiasm "oh si, y Sedna tambien¨. I was completely blown away that he had heard of Sedna, the first Kuiper Belt Object discovered in 2003. It was something only the astronomy community and interested space fans would know about. It motivated me to teach an astronomy lesson to the children on Sunday during the festival. What impressed me most about the entire community was their excitement and passion. Even though they had fewer resources and lacked many of the luxuries we take for granted in the US I was inspired by their energy and commitment to the community. On Thursday evening April 26th, the brothers of Phi Kappa Sigma fraternity at MIT hosted a benefit dinner for the Children of Guayaquil. The evening was a complete success with representation from the top faculty and administration on campus, including Dean of Undergraduate Education Daniel Hastings. In addition to raising funds for the foundation, the dinner provided an opportunity to facilitate dialogue about the importance of international experiences within the context of an MIT education. Professor Jan Wampler, designer of the community center in Pascuales gave a presentation on his international work and the impact that it has had both on his student and in the impoverished communities with which he works. I was very excited to have an opportunity to share our stories of hope and triumph and to share a little taste of the energy and passion that defines the community of Pascuales. It was a very special evening that we hope to make an annual event. Special thanks to President Jeremy James and all of the brothers at the Phi Kappa Sigma house for their hard work and dedication to the our children! Pascuales welcomes visitors from MIT! Bertha stood in front of the crowded school house full of women, energy beaming from all sides. "We must unite!" she yelled. "We all are fighting for the same cause; for our children, for their futures, and for the improvement of our community. We must fight together!" Cheers erupted and I felt like I was standing in a gospel church. "We must volunteer our time and our energy" she continued, "because payment will come in the form of opportunities for our children and that is more powerful than any dollar!" Her words were direct duplicates from the ones I used the day before to motivate these ladies and explain their responsibilities as a community; what was necessary on their part to bring this to fruition. I have said from the start that this is not the foundation's project, it is theirs; we are simply here to support them and guide them as they fight. And the town has risen to the occasion in more ways than I could have ever imagined. As Bertha continued, ladies began yelling out ideas and suggestions of how to raise awareness, organize the community, and fight for material donations. I was proud because what I said had stuck. I was proud because the faces in the room shown bright with a light of hope. And I was proud because in that tiny room, right next to each other, sat three leaders from three different community groups in Pascuales that had been fighting for decades about absolutely nothing. These three rival leaders were, for the first time, agreeing with each other and uniting for a common goal. I realized that all they needed was a positive project to work together on, and that was enough to spark the flames of friendship that shone so brightly that night. 1. MIT Architecture Professor Jan Wampler and 3 of his architecture students visited Pascuales for 4 days to present their designs and building model. They walked the town, meeting community members, explaining about their work, and creating bonds of trust through the universal language of Soccer. It was the first time that Jan had ever played soccer in his entire life... he did great! (even though his team lost) All the people on his team made him promise that next time he visits Pascuales he has to bring proper sports clothes and they will give him a re-match! 2. On Sunday January 21st we threw a town celebration with food, music, dancing, and laying of the first stone. Over 800 people came to learn and participate! During the event, people from all over the town came out from their houses, all dressed up, and surprised us all with performances of singing, dancing, and even ballet! They were so proud to share their talents and their culture with us. 3. We have successfully united the architecture departments of MIT and University of San Francisco in Quito (USFQ) to work together in support of our initiatives. Professor Victor Viteri from USFQ traveled with us to translate Jan's speech and help with communication during their time in Pascuales. Victor is also working to help with the next steps on the construction drawings before construction begins. 4. A representative from the MIT OCW website documented the whole trip with pictures and audio which will be uploaded on the MIT website for the international community to see. 5. National Ecuadorian News Station Gamavision aired a story about our foundation on the nightly news Thursday January 25th. The news report showed the entire group from MIT, the 3D model of the community center, as well as shots of the town where we are working and interviews with locals about their feelings on the project. It was a powerful piece that is now posted on the website. 6. University of San Francisco in Quito (USFQ) published a front page story in their University newspaper. Another one of our goals is to encourage University students from Ecuador, who generally come from the most affluent families, to become involved in our work and learn about the struggles that people in their own country face every single day. We want to open the eyes of the future leaders of tomorrow so that they are sensitive to the needs of all people and understand the differences that exist in struggling communities. Despite all of this news, the biggest accomplishment for me up to this point has been uniting the town. There is power in numbers and they are beginning to see that power first hand. The women of Pascuales have formed a legal committee called "Frente Femenino!" just to support our work. They have already begun to organize bingos and raffles, and on Monday they organized a town event to clean up the land and remove trash from surrounding streets. I have never seen a group of people come together so quickly and so passionately. This town is LLENA DE ENERGIA. Our next challenges are huge but we will continue to fight with the same passion that has carried us this far. First off, we need to continue raising funds. Jan did an incredible job designing the center but the expected costs for construction are more than we anticipated at the start. If you know someone who would like to sponsor a part of the building, we will be putting up a plaque in each room to honor supporters of this project. For information on how to donate to the cause, you can check out the website at http://www.ecuadororphans.org/, or email me directly at [email protected]. We Appreciate Your Help in spreading the news! All construction labor will be hired from within the town of Pascuales to provide job opportunities and increase economic flow in the area. We have already collected resumes from Pascualeños that are skilled in concrete work, brick lying, carpentry, and electrical work, among other things. Our second big challenge is finding a highly experienced General Contractor to direct the construction. We need someone who will be sensitive to the cultural differences that exist in an impoverished community and carry on our legacy of friendship and understanding that are the essential keys to the backbone of this project. We need someone who will become as passionately involved as we are. More than a job, this is an experience that will never be forgotten. Anyway, I just returned to the states early this morning and classes at MIT begin on Tuesday so it will be another full semester of balancing engineering and international development... but there is nothing that makes me happier. I will send out a quick note when the website renovation is completed! I just got back from an incredible month in Ecuador, continuing work on the projects which will provide basic human needs and educational opportunities for impoverished children in the Ecuadorian town of Pascuales. There have been many challenges along the way and important lessons learned, but things are moving along better than I could have ever imagined. A 600 square meter plot of land has been secured under a 25 year comodato given by the government of Guayaquil. When the time is right, Children of Guayaquil is prepared to purchase the land from the government and donate it to the community to secure ownership, but for now we can begin work under the protection of the comodato. The facilities that we are prepared to construct include the library, community room, daycare center, medical center, kitchen, and outdoor play area. 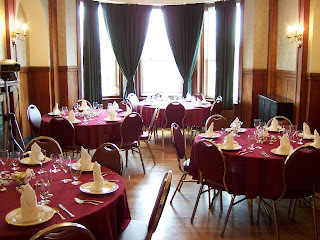 If space allows, we will also plan accommodations for volunteers. The community is very excited and very grateful for the support that we are providing, but most importantly they have shown their dedication and willingness to work hard. The very first step in securing land is building a fence around the area which you would like to occupy and then taking your request to the municipality. 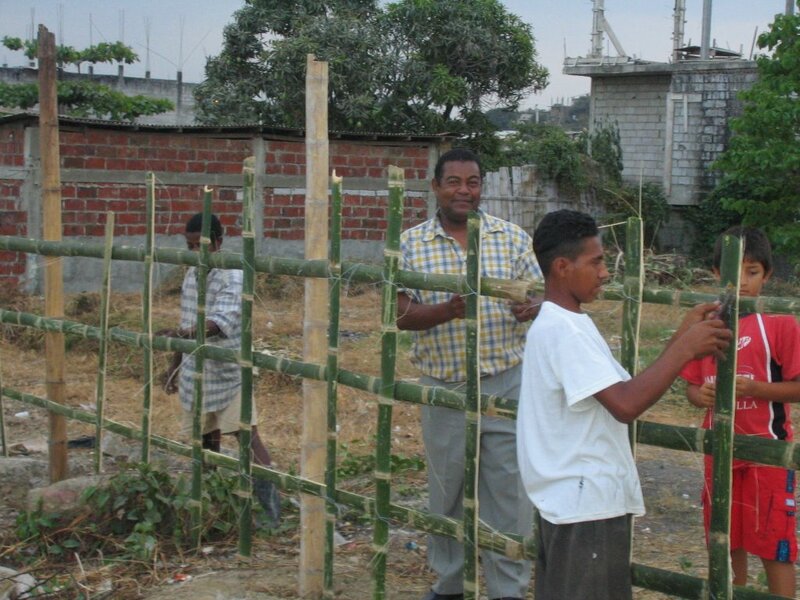 Wednesday night at our town meeting we established exactly where the project would be developed and Thursday morning I arrived in Pascuales ready to organize the building of the fence. HOWEVER the fence was already built. It was COMPLETELY DONE. The entire town united, some people brought bamboo, others small amounts of money to buy materials, others just brute manpower, and they did it all by themselves. This is the type of attitude and dedication that I saw from the community members several times during the trip and it is what makes me so confident and excited about the success of the work here. The plot of land has a small school room built in one corner which is run by an incredible man, Professor Quinones, who has dedicated 8 years of his life to improving the education in Pascuales. Every day after classes end, he gives 4 hours of EXTRA classes to people in the community who can either not afford education or adults who have never attended school. How perfect is it to build a library right next to the school room? I have been in touch with the foundation ORI who will be providing weekly food donations for the children in the daycare center as well as a salary for the employee who will be caring for and cooking for the kids during the day. We have already established a strong relationship with the lady who will be responsible for this job and she is excited to work with the young children in preparation for them to attend school next door when they reach the age of 6. 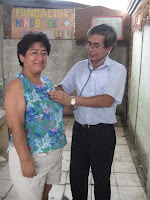 In addition, we are collecting a mini census to organize distribution of the labor when we are ready for construction. We will be hiring all of the workers.. electricians, mechanics, wood workers, ect. from within the community so as to provide jobs and increased economic flow in the area. MIT Architecture Professor Jan Wampler will begin plans immediately and will be making a trip to Pascuales to present his drawings in late September or October. Things are moving along just great. I also want to tell you the great news that Andrea Pazmino is now the official Director of Ecuadorian Affairs and has been traveling with me every step of the way. Andrea is a 21 year old Administration and Foreign Affairs student at the prestigious University of San Francisco in Quito. She is also the collegiate tennis champion of Ecuador. Andrea brings a level intellectual capabilities and communication skills that I can not provide in Spanish. It is amazing how well we work together. When my language skills limit my communication, Andrea jumps right in and finishes what I was trying to say as if she were listening to the words inside my head. I can't even tell you how great it is to have a partner that not only brings so much valuable insight to the table, but is fun to be around. We are having a great time together and enjoying the successes of our hard work. While I am back in the States, Andrea will continue to monitor the progress of the projects in Pascuales and will be the link to our Ecuadorian contacts, including the TV Stations and Newspapers around the country who are following the work. We have a lot of work left to do and lots of funds to be raised, but we are off to a great start. As always, I can't even begin to express my gratitude for your support in making this happen. MIT Architecture professor Jan Wampler has offered to design our first orphanage in the town of Pascuales, as well as oversee construction for the duration of the project. He will select 3-4 MIT undergrad and grad students in the Architecture department to work with him during the fall semester. Plans for the orphanage are projected to be completed by October of this year, and construction completed 3 months later. Jan Wampler is an internationally renowned architect and teacher, recognized around the world for his work in over 20 countries and his inspiration to future architects. Throughout his 35-year career, he has received numerous awards for both his teaching and architectural work including a nomination for the AIA/ACSA Topaz Medallion, considered the most prestigious award bestowed on an architect. Wampler was also honored as the 1999 recipient of the ACSA's highly-esteemed Distinguished Professor Award, which recognizes supreme excellence in architectural education. Wampler has been a member of the faculty at MIT since 1970 and has twice received the university's Irwin Sizer Award for Most Significant Improvement to MIT Education. He has also taught at the Rhode Island School of Design, Harvard University, University of Hong Kong, the University of Sydney, and the University of California, Berkeley. Wampler has gained wide-spread respect on an international level and has been sought out by the United Nations to plan and raise funds for various initiatives world-wide. In his teaching, Wampler seeks to expose students to cultural environments outside the United States to increase their sensitivity to and awareness of international projects. He involves his students in all aspects of his local and international work. [email protected] | Site by Vident Technology and Pixtails Design | ©2006 Children of Guayaquil, Inc.